This past Tuesday we invited Michael Marotta, founder of Vanyaland, former music editor for the Phoenix and music director for WFNX to curate this week’s Tuesday Night Recording Club. Michael is a venerable encyclopedia of rock music culture. His brain is filled with release dates of iconic (and not so iconic) records, debut bills of shows from the past and more. When we asked him what seminal moment in music history he’d like us to tackle, he suggested The Smashing Pumpkins’ “Siamese Dream” album. 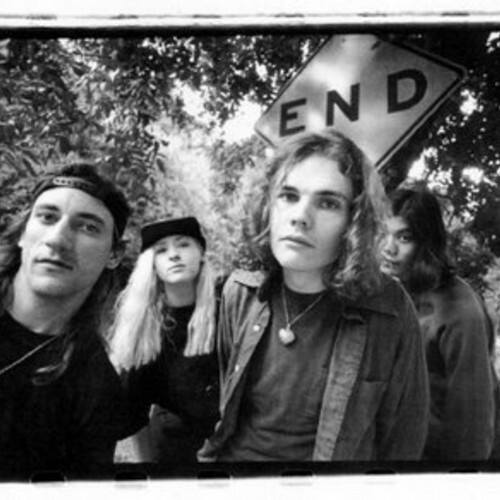 We thought that this was a great suggestion, and after Michael told us that one of the factors for his choice was to celebrate the 20th anniversary of Siamese Dream’s release…we were all-in! Additionally, Michael suggested the involvement of Nathaniel Leavitt (Parlour Bells, Old Jack) to take on the somewhat overwhelming task of playing the guitars on our evening of homage. Nate was originally planning on playing a local show (also curated by Michael) in tribute to the anniversary of the release, and had consequently learned the entire album on guitar. Plans for the show ultimately fell through, but we made sure that Nate’s efforts were n’t completely squandered! We would have been hard-pressed to pull off the thirteen-plus guitar tracks on our release, with someone less qualified. Nate knocked it out of the park! Another stroke of luck for us, was that we had located the exact model of drum set (Yamaha Maple Custom) that Pumpkins drummer Jimmy Chamberlin used on the “Siamese Dream” album…and we also enlisted Zippah Studios “regular” – Steve Chaggaris, a true Chamberlin fan to play drums. Like Chamberlin, Steve has a background in Jazz drumming and honestly, their styles are incredibly similar. This helped us achieve a truly uncanny drum sound to the one on “Siamese Dream”. My assistant (staff engineer) Annie expressed a strong interest in playing bass on this one, her main reason being that she, like D’arcy is a “chick bass player with blonde hair”. We let her think that she got the part for that reason, but actually it was because she’s an awesome bass player. Aaron brought in a very convincing Pumpkins-esque song that Michael aptly named ” Who You Are”. Before I get into the technical aspects of how we achieved the “Siamese Dream” sound, I don’t want to forget to thank Steve from the band “Air Traffic Controller” for seeing a tweet that we were in session and taking it upon himself to stop by the studio with beer…you sir, are always welcome to stop by. Okay, now some of you are like; “hurry up already and tell us about the Billy Corgan guitar sound” and the rest of you should probably skip to t he end of this post and click “play” on the video…haha. So here we go! The main ingredients…A Fender Stratocaster with either lace sensor pickups or Mini humbuckers, an Electro Harmonix Big Muff pedal (the silver version), a Marshall JCM800 with KT88 tubes (swap out el-34s and re-bias). We had a preliminary pedal chain ready to go (see pic). I ran a Tone-bender clone (Earthquaker Devices Tone Reaper) before the Muff to use for that “destructo” solo tone. 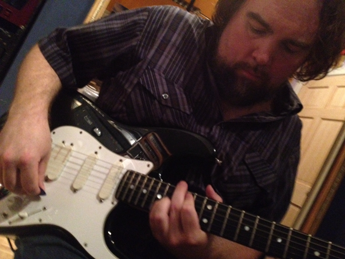 Billy used an MXR Distortion II for this application, but we couldn’t track one down for our session…hence the reaper. We also experimented with an EH micro synth during the solo section, but ended up using a different take, because we liked the performance better. The Micro Synth is really cool though, and we could easily achieve a “nasal” guitar solo tone with octaves…much like you might hear on “Siamese Dream”. After the Muff, we had a couple of phasors to choose from; an MXR Phase 100 and a Musitronics (Mu-Tron)…both got used at different points, both on their slowest setting. So how many guitars did it take to achieve a respectable Pumpkins sound? The answer: Four main rhythms all tightly doubled and panned opposite each other playing mostly open (first-position chords) plus two more with the 6th string tuned down a whole step and playing power-chord forms. Those six tracks make up the basic rhythm guitar bed. Additionally we added two lead tracks, playing in the 2nd verse, as well as two more that play in the verse intro, bridge and choruses. 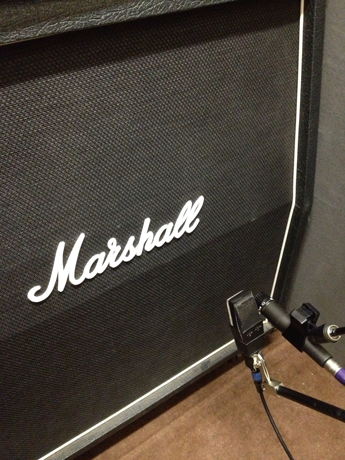 We also tracked two clean guitars, which can be heard in the opening of the song. Only one of those tracks (the rhythm) continues through to the end. So those twelve tracks plus Aaron’s main (slightly dirty) guitar from the basic track makes thirteen…. plus a solo guitar – that we didn’t double…if we had more than an evening to track all of this, we probably would have painstakingly doubled it, but I really felt like the spirit was there, and I honestly don’t regret the single solo. 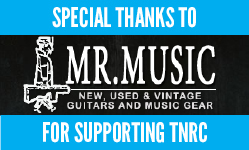 The final count…Fourteen guitar tracks…nice job Nate! 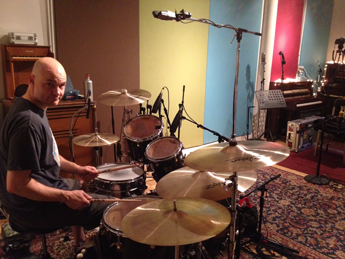 As I mentioned, we had the same series of drums (Yamaha Maple Custom) that Jimmy Chamberlin used on Siamese Dream. 22×18 kick drum, 10×8 and 12×8, rack toms and a 16×16 floor tom. Our drummer, Steve set up the 12″ rack tom to the left of the 10″ (drummers perspective) just like Chamberlin. It’s more common to set up toms from high to low (left to right). Just this simple swap influenced the sound of the drum fills. We mic’d the toms with Sennheiser MD421s, the kick with an AKG D112 on the inside and a Fostex M11RP printed ribbon mic on the outside. Frequency boosts of 4.5khz, 6.8khz and a dip around 300hz (inside mic) got us 90% there. An additional attenuation of 200hz & 400hz on an outboard Urei 530 graphic EQ got us to the point where the kick sounded right in there. I should probably mention that I was toggling between the song “Mayonaise” and our drums for reference. The severe amount of EQ is most likely a result of the fact that generally tracks will be eq’d in stages…a little at tracking, and a little more again at the mixing stage. I always keep this in mind. If Steve wasn’t as consistent with his hits, I would have refrained from boosting so much in the upper frequencies as it would most likely result in an uneven sounding kick drum. 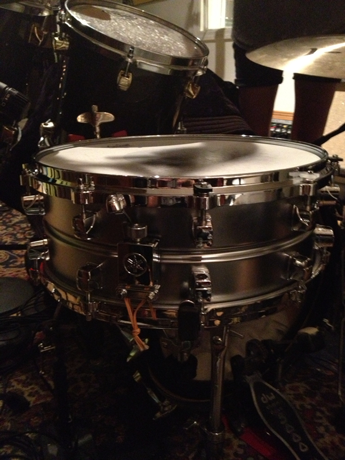 The snare drum, a Yamaha Jim Chamberlin signature model was mic’d above and below with Shure SM57 mics. I brightened up both mics to closely resemble the snare on “Mayonaise” and compressed top and bottom with a pair of Urei 7110 compressors…check out the attack/release settings in the pic. 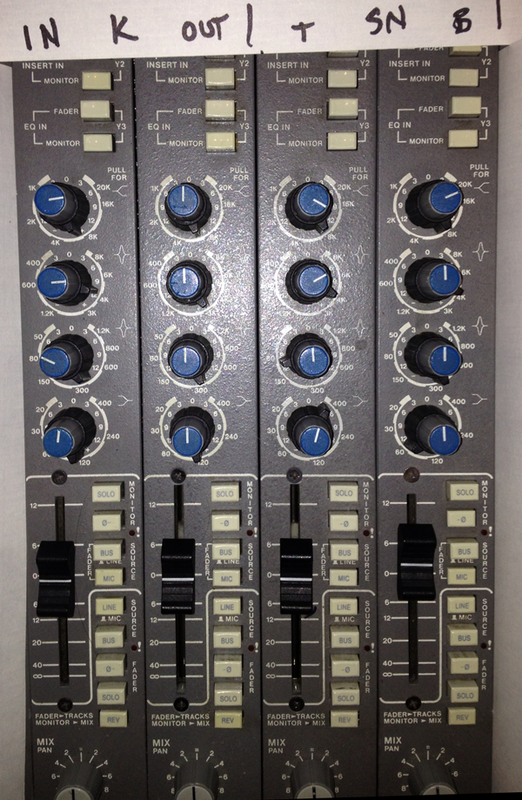 We used a pair of 414s for overheads in an XY configuration. I was lucky enough to find some video of “Smashing Pumpkins” in the studio from the SD sessions, which clued us in to placement etc. We also put up an AKG C12VR in figure 8 pattern 12 feet in front of the kit and compressed it with a Chandler Limited EMI TG1limiter in “limit” mode and a fast release time (position 2). Annie brought in her 197 8 Fender P-bass and we combined a direct signal with our Ampeg V4B amp and mic’d an 8×8 cabinet with an EV-RE20 microphone. To help achieve that solid and consistently prominent bass tone (that I hear on many Butch Vig productions) I chose to EQ the bass signal (Chandler EMI TG Channel MKII) before the compressor (Collins 26U). This allowed me to heavily boost fundamental low frequency signals that the limiter would in-turn react to in a way that maintains a full and consistent tone throughout different dynamic sections of the track. 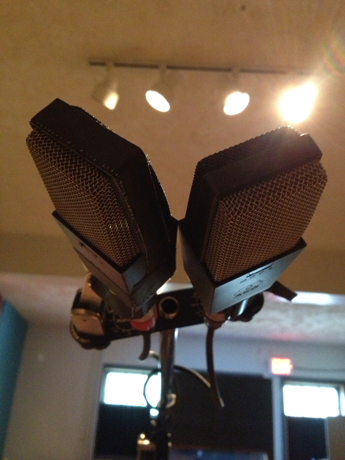 Aaron’s vocals were tracked through a Neumann U47 tube microphone and compressed with an 1176 compressor on 4:1 ratio. We had him sing a few passes so that we’d have enough to make a tight vocal double…this is a big part of the “Pumpkins” sound. At mixdown, I sent Aaron’s vocals to a pitch program on the Eventide H3000 Ultra-Harmonizer and pitched the left side up 12 cents, the right side down 12cents. I panned the effect returns at about 30 degrees from center (and opposite each other). I delayed each side by 30 milliseconds and set the feedback on 21%. I’d be surprised if this wasn’t exactly the type of effect that was commonly used on Billy Corgan’s vocals. Well that about covers the technical stuff. I hope you like what we did this week…I think that once again, Aaron brought in the perfect song for us to apply our “mad science” to. Special thanks to Michael Marotta and his Vanyaland TV for curating this week and also hanging out in the studio till the wee hours with us! Enjoy the (extended) video coverage below, and feel free to grab a free download of the song as well. Tuesday Night Recording Club – “Who You Are”- Inspiration: Smashing Pumpkins – “Siamese Dream” Album from Tuesday Night Recording Club on Vimeo. Vanyaland TV celebrates Smashing Pumpkins “Siamese Dream” with the Tuesday Night Recording Club of Boston from MediaBoss Televison on Vimeo.